We’ve been looking for a workbench with a style that would be suitable for our upstairs office. We plan on doing some detail work and don’t want to do it next to our sawdust generators in the basement. We thought about building one, but thought we’d check Craigslist first. Sure enough, the interns located a promising one. We haggled a bit and were able to come to an agreement that made everyone happy. The guy selling it lived just a few miles away and was willing to drop it off at the office as long as we helped load it onto the truck. The delivery alone was worth what we paid for the unit! 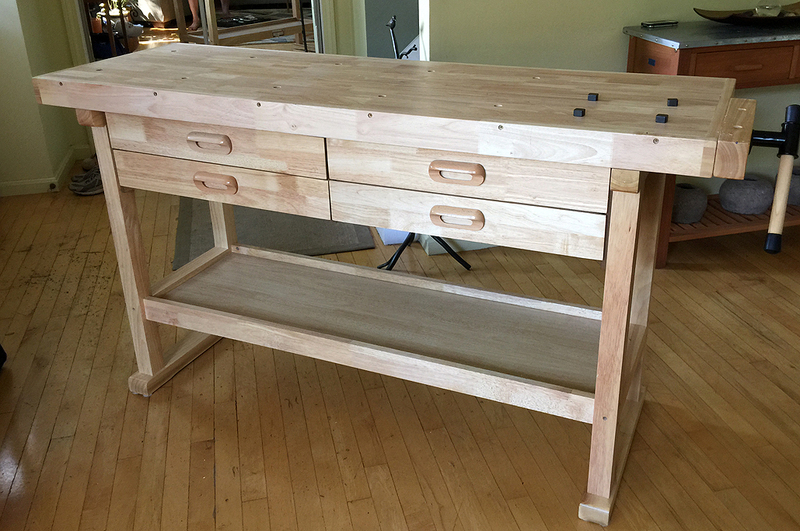 Our “new” Windsor Design workbench has a 60″ hardwood top with a clear lacquer finish, four felt-lined drawers, a bottom shelf, and a block vise at the end. While the top may look 2″ thick, it’s not. It’s really only 3/4″ thick. It appears thicker because the skirt around the edges is 2″ wide. Still, three-quarters of an inch is plenty thick for our purposes. The strips of wood are solid maple (not MDF or veneer). They are short 4″ pieces held together by finger joints to make longer ones. The resulting piece is heavier and not as strong as a comparable solid piece, but it is a lot less expensive. This is because the process allows manufacturers to take wood scraps and convert them to pieces of lumber. The block used for the base and the vise, however, are solid 2″ x 2″ pieces. The drawers are made using simple lap joints and held in place by screws. Not as strong as dovetail joints, but should hold up for light duty uses. The drawers are on ball-bearing steel guides and rated to support up to 25 lbs each. The ones in our bench are well aligned, has a bumper stop, and open/close smoothly. The workbench, if purchased new, comes flat packed and assembly is required. According to the seller, it took a few hours of time and effort. The sturdiness of the final product has a lot to do with the skill of the assembler. Fortunately for us, the previous owner had done an excellent job putting it together. When we got it to the office, we did notice it had a slight side-to-side wobble. The issue was traced to some of the bolts holding the bottom shelf to the legs. They must have worked loose from the connecting nut over time. Once we tightened them up, the bench was rock sturdy. This was a solid buy. 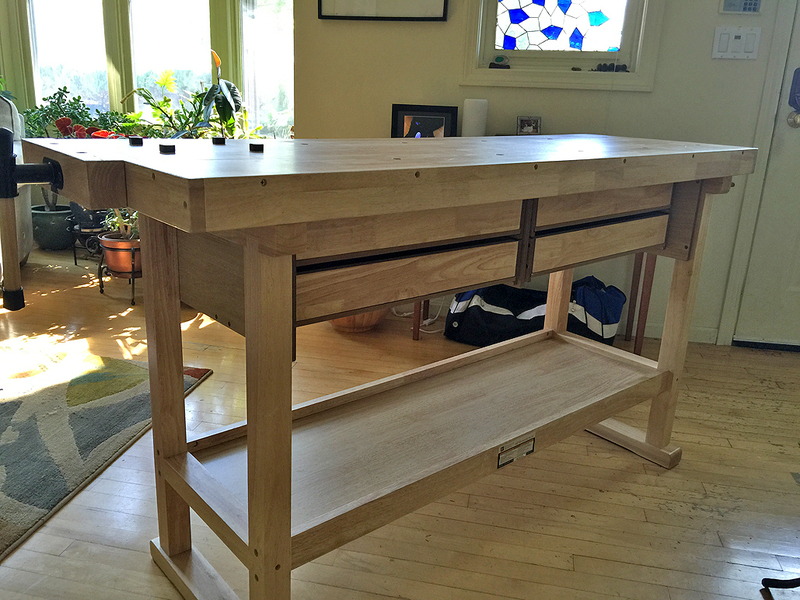 The list price for the Windsor Design workbench is $200, but it can be found new for much less. Those looking for a well-designed workbench can pay five times more and not find anything better. If a used one is available and is well-assembled, it’s a steal. You will not only save money, but you will be able to put the unit to work as soon as you get it home. We plan to do exactly that once we move some things around and make room for it (although our copy editor is campaigning vigorously for turning it into a wine bar).